WAREHOUSE FIND! We Just located a small stash of these (i.e., they won't last long [in fact – gone!]). 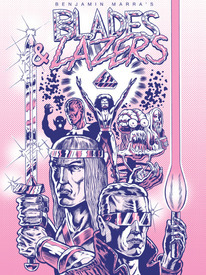 Here it is: 40 oversize (9" x 12") glossy pages, printed in metallic pink and blue collecting the complete Blades & Lazers saga by Benjamin Marra. Page after page of archly ironic deptictions fo classic space fantasy comics tropes that allow you to laugh at yourself for still enjoying this; to have your cake and eat it too! 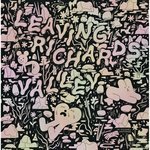 PLUS -- an all new back up story by Lale Westvind!